Last year 2018 was quite something! So many energetic portals of eclipses and full moons and supermoons – we are all certainly more sensitive, even if we don’t consciously engage with these energies, they effect us nonetheless. So, how do we deal with these energies? How do we stay grounded? Already this year we have experienced waves of Light hitting the Earth and many people are feeling an upwards surge of energy, more connection to Truth and a desire to change their lives for the better. The energies coming towards us now are creating more Light and activating strands of DNA which read the RNA or Soul Essence – in other words, our total complete Light Being – we are ascending to BE the Light. However, we are still dealing with a 3rd dimensional reality, with all the 3D issues that go with it. institutions, politics, organized religion and our own deep trauma and the dramas of others around us. So, feeling into this I wrote a post on Facebook and this inspired me to write a little more for you here. For myself, this year is all about raising Consciousness. In whichever way, through crystals and crystal healing, pellowah energy healing and eating raw foods and superfoods. My mission is to help you be the best you can be – so based on my own experiences, I’ve created a few points to ensure your own Ascension Care Plan. Get enough sleep, even though the Light waves may create sleeplessness at times, allow extra time to catch up on sleep when you can. When you sleep, you are absorbing and assimilating Light. Create your own meditation space or sacred space whether inside or outside. This is a place perhaps with plants, candles, pictures, colours that speak to YOU of divinity. Its a place that’s sacred to your own divine reflection. Place crystals there or flowers, whatever you wish. Use sound or just be silent when you meditate and connect with Source. Make this a regular daily practice. Improve your diet. Drink more water, cut out junk foods – drink green juice at least three times per week. Investigate superfoods and move to a plant-based diet if you can. Selenite – white or orange or even green – selenite is soft and gentle yet so very Light giving us a direct link to Source. Blue Lace Agate – great to help us communicate with Source, our Higher Self, Angelic Realms – as is also Angelite and Celestite. Herkimer Diamond – so clear and connecting to the web of Souls, all that is – complete Unity and Oneness. Garnets – grounding and helping us to make sense of all these high vibrations and bringing them into our physical body – without grounding we shall all be air-headed, floating around and not able to assimilate the Light properly. Bloodstone – also grounding and helping us to understand ourselves, releasing what we no longer need and rebuilding a new version of ourselves in Light. Move your body – dance, yoga or whatever brings you fully into body that you enjoy. Get regular energy healing treatments – pellowah energy healing is a ‘radical shift in consciousness’, crystal healing – to rebalance in wholeness and Light, Reiki and Angelic Reiki. So there are my ascension tips in brief. I will be presenting more workshops this year around Consciousness – so stay tuned for those. 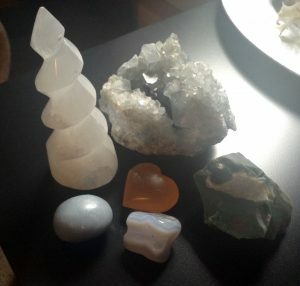 Starting off is the very first Crystals for Consciousness event on 26th January. Exploring crystals to assist consciousness and feeling into our own personal Soul’s Light and needs through mandalas and personal healing. More on the events page here.